We pride ourselves on our distinction as a quality mover. Our personnel is extensively trained and committed to caring for your belongings as if they were their own mother's keepsakes. We are a locally owned and operated moving and storage business; serving the community for over 20 years. Commonwealth Movers provides moving and storage service for individuals and businesses needing to relocate on the East Coast area. 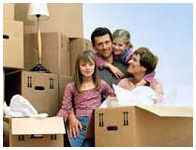 Commonwealth Movers have been moving families for over 20 years. We are the professionals, that's why you can have confidence that your move will go smoothly and your belongings will be cared for as though they were ours. Below are some helpful hints about preparing for moving. If you would like one of our complete guides, just call us today, we'll be happy to mail one to you, or fax it immediately. You can get a FREE estimate for your move by filling out online our quick estimate form. 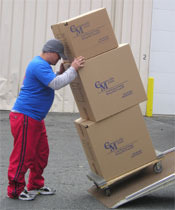 Full service storage, distribution services and non-records commercial storage. We know that your move is as unique as your business that's why we listen so well. We'll focus on your requirements to make sure that your business is moved into new facilities as efficiently as possible. When we know what your business move requires, it makes your job easier. 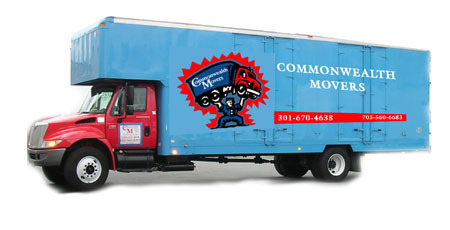 Commonwealth Movers becomes your "moving department." Our Commercial Move Project Manager will work with you to solve the important planning questions and establish a time table for your move. Organization makes for efficiency and saves you money. 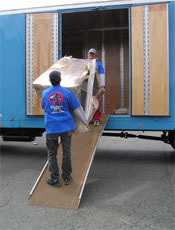 Commonwealth Movers offer experienced professional packing services at reasonable prices. If you don't have the time or know-how to pack your house, let our professionals handle ir for you. This gives you more time to take care of those "other important things to do", while being rest assured that your complete move is being handles with tender loving care. Get a FREE Estimate today by using our easy to fill-out form. We will respond to your request for an estimate within 24 hours. If your new location finds you short on space or you have a little time between moves, Commonwealth Movers can offer you clean, secure storage at its modern warehouse facilities located in Columbia and Gaithersburg, Maryland. Your belongings will be cushioned and wrapped in cloth padding and sealed in our dust free, solid wooden containers. Each shipment is inventoried and tracked in our system. We offer short term or extended term storage. Managed JLPalfrey for Shopping Portals Inc.